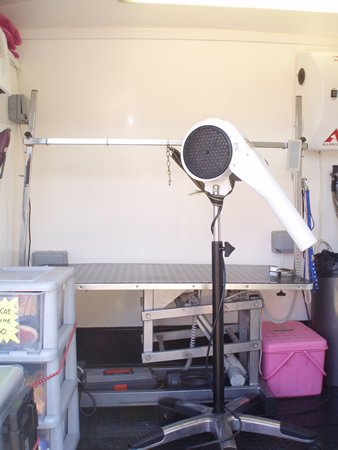 Animals Sitting Pretty operates from a state of the art, custom designed and built mobile grooming van, which uses the latest professional equipment. 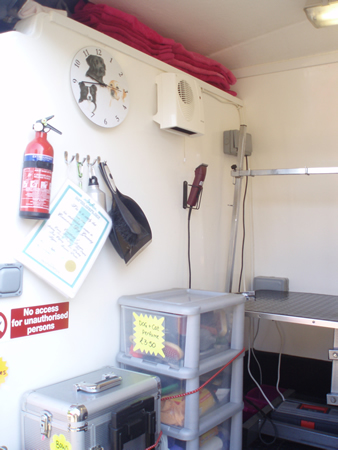 The grooming table is fitted with comfortable and adjustable harnesses to refrain your dog falling off the table. The table is hydraulic which means that large dogs are able to step onto the height adjustable table. There is a combination of 2 dryers which are used both with adjustable heat and air flow to suit even the most nervous of dogs. 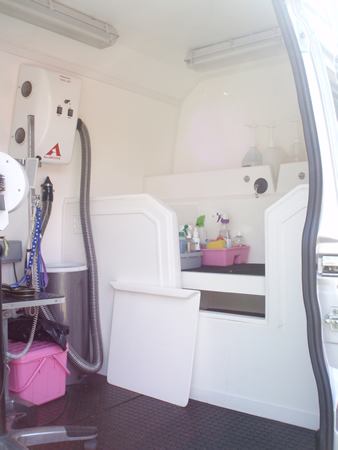 All equipment and the mobile salon is cleaned, disinfected and sterilised on a daily basis. The hydro-bath is also fitted with a harness and a non slip mat. The van is equipped with a water tank that holds up to 140 litres of warm water in which last's throughout the working day. When arriving at your home, firstly we will meet your dog and form a bond with them especially for nervous dogs, time is taken also to create friendship as we feel that for the dog a positive grooming experience is exceptional and them feeling pampered is our priority. We will need to park the van on a flat ground surface and a mains electrical supply near would be needed for the vans equipment operations. If unable to park in your area, then we are able and willing to collect your dog, groom it at the home property and then bring back to you. There is a pick up charge of £5. The truck is fully insured and safe to transport your pet. Please see pictures provided. When we collect your dog you will be asked to complete a registration form and asked to fill in details of how you would like your dog to be groomed. Also we would ask that you to tell us of any medical or behavioural problems your dog may have. We will come and collect your dog but will not take the dog without authorisation from the owner.